Home page - Wrapmation inc. Founded in 1990, Wrapmation provides automation products and services to the pulp and paper industry, focusing on the automation of paper mill finishing and warehousing. 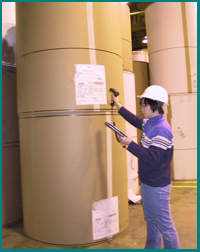 The flagship product, TRAQ Manager, is a computerized roll tracking system designed specifically for paper mills. TRAQ Manager is the premier PC-based roll tracking system running on industry-standard Windows networks. Dedicated to innovation, Wrapmation's staff designs and develops the finest roll tracking systems in the world. Everyone who works at Wrapmation shares a common passion of working with sophisticated technology and computing systems. Wrapmation is located in Montreal, a city whose history is closely linked to the paper industry. There are no fewer than seven paper company corporate offices within 3 miles of Wrapmation. Montreal is also home to the Canadian Pulp & Paper Association (CPPA), Pulp and Paper Technical Association of Canada (PAPTAC), and the Pulp & Paper Research of Canada (PAPRICAN). Montreal hosts the world's largest annual pulp and paper conference, called "Paper Week". 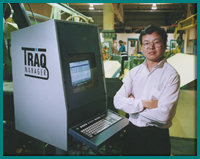 1993 - TRAQ Manager becomes the first roll tracking system in the world to run completely on industry-standard PC's, networks, and operating systems. 1994 - Wrapmation is the first roll tracking company to publish a web page. 1995 - Wrapmation offers "fax-on-demand", permitting customers to request documents from the mill using a touch-tone telephone, eliminating the need to install a terminal and modem at the customer site. 1996 - Installation of the world's first personal computer with wireless LAN technology on clamp trucks, providing drivers with full Windows-based applications. 2003 - Wrapmation installs the world's first roll tracking system that is fully Microsoft .NET ready. 2004 - Fully integrated loading pattern optimization function for trucks and rail cars with 2-D and 3-D presentation. 2005 - TRAQ Manager offers business intelligence (BI) features based on one of the most powerful and cost efficient BI platforms - Microsoft Analysis Services. 2007 - Order Entry, load and roll query and claims can be done on a website. 2007 -TRAQ Manager implements Internet Portal, based on Ajax technologies. Functionality included Web-based order entry, carrier bidding system and customer claims. 2008 - TRAQ Manager supports papiNet Open Global XML standard. 2011 - Integrated accounting system with JDE. 2012 - Android Roll TRacking App to view loads, certificate of analysis, shipping schedule and order status. 2013 - .Net application support for entity framwork. 2014 - Photographically documenting load securement at departure. Wrapmation is always innovating, finding new ways to improve operations in the pulp and paper industry, including the incorporation of Novell's SFT III technology into roll tracking systems. To date, no SFT III-based TRAQ Manager system has ever failed or lost data. TRAQ Manager was the first to offer a "What You See Is What You Get" (WYSIWYG) roll label designer. We know of no other product that offers this functionality yet. By being web-enabled, TRAQ Manager was the first product to allow clients remote access to their orders. The TRAQ Internet product provides clients with reports, and allows authorized individuals to enter orders, change delivery dates, or make other changes to orders or schedules remotely. The industry eventually called this service eCommerence. Our latest challenge puts us on the leading edge of Microsoft's new .NET platform, providing XML web services and a vast array of smart clients such as the web, Pocket PC and mobile phones. © 1996-2019 - Wrapmation Inc.
Read legal and copyright notices. - TRAQ Manager and Load at Departure are trademarks of Wrapmation Inc.